Whether you were aware or not, sequel for another old and famous game franchise have been successfully funded by the crowd at kickstarter.com. 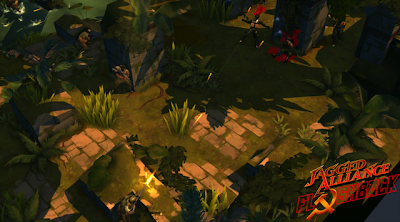 The game's called Jagged Alliance: Flashback, and while for starters it looked like funding would not quite reach it's goal, it actually did at the end. Out of $350 000 overall goal there's now approximately $358 000 budged funded and three final hours to go. Last year we saw Wasteland and Shadowrun franchises being re-started by crowd-funding, then Torment, which is spiritual successor to Planescape: Torment without the actual ties to Planescape universe though. Nevertheless, this is fresh attempt to take Jagged Alliance franchise back to it's roots. After not-so-well received Jagged Alliance: Back in Action (2010) that was mediocre in it's best gameplay areas, developer of the game Coreplay gave up. Then it was time for Cliffhanger Productions to bring Jagged Alliance Online to the table taking JA series into online-mode and making it browser friendly. Needless to say, this too the franchise even further from it's origins and personally it was not wise move in my opinion. Now it's turn for Full Control, rather fresh and unknown company from Copenhagen, Denmark, to try and develop a new Jagged Alliance game, called Jagged Alliance: Flashback. And since they broke their kickstarter goal, they are going for it whether you like it or not. Full Control itself has no much mention worthy games released yet. However, in their kickstarter presentation they claim their staff have been working previously on games like Crysis, Crysis 2, Brothers in Arms: Hell's Highway, Star Wars: The Old Republic, Unreal Tournament and so forth. But to what extent, we don't know. 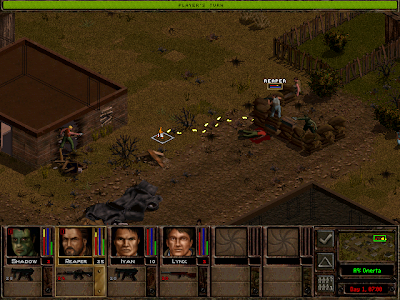 Thinking of game like Jagged Alliance (from it's roots invented by the great Sir-Tech) those games mentioned above keep me a bit skeptical about whether Full Control can really make a worthy sequel to Jagged Alliance the original and second. They have some experience, but it's a bit shady of a side, and then again games they mention aren't too close to a game like Jagged Alliance. Mainly action and shooters. Nevertheless, Full Control has promised to make the game as close to the spirit of the original games as possible, as well as to adapt most of the old games gameplay mechanics, which is certainly a great thing to hear, just if they are up to keep their promises. Gameplay elements in Jagged Alliance 2 were top notch, and if you are set to make a true sequel then you shouldn't fondle and change those elements very much. Full Control has made promises in their kickstarter campaign website to bring cheesy humor back into the game, that was featured well up to Jagged Alliance 2 (included). I always loved the cheesy one-liners and different fun personalities of the mercenaries. Another thing they promise is to feature interactive dialogue between for example civilians and your mercenaries that may lead into different end-results of the conversation. The story of JA Flashback will take place in the Cold war era of mid 80s and expand upon story of how A.I.M. (The Association of International Mercenaries) was originally formed. One thing that "worries" me slightly is hearsay about JA: Flashback being sort of a smaller scale game (comparable to JA: Deadly Games) to actually see if there's enough interest in the game, which may lead into full development of actual bigger Jagged Alliance 3. Sure, it would be awesome to see a full scale and large through and through developed Jagged Alliance game, but it those were the plans then would Flashback be a watered down version? Another thing that worries me a bit is that they seem to be using rotatable 3D view which just doesn't seem so natural choice tactical-wise as static pseudo-isometric 2D camera view with grid-based movement. But we will see about how it all comes along. Should Full Control keep tactical elements and combat close to the original, and play wise with loot, leveling bargain-systems, this game could become a good one. Oh yes It is a good game. This is an Awesome game.I enjoy playing it.